I painted the majority of my place an off white/light beige color I just adore, because it looks very clean. With that in mind I painted all the wood and doors a solid white to let them stand out but not too much. We already had a "natural" accent wall (a niche) in our foyer, but I wanted to draw more attention to it with a bold accent color that would look good and be appealing to the eye. 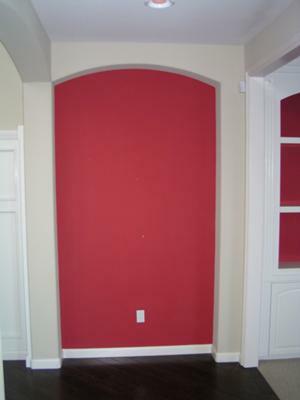 I choose to paint the accent wall a red - the color I also used in the adjoining dining room, that way the area seemed unified. To the left of the accent wall is our front door, and directly across from the wall where I am standing to take the photo are the stairs. When painting your wall you have to be very careful when doing the trim and edges, because if you go over your seams just a bit, it honestly just seems a bit off and looks unprofessional. I suggest you tape off the corners and paint it that way. You can even do a sponge treatment or use some other decorative painting technique for a different look. This looks great, I would love to see how it flows to the dining room with the same color. We started with a crimson accent wall, and want an off-white/light beige or tan but they all seem too yellow. What name is your beige color?